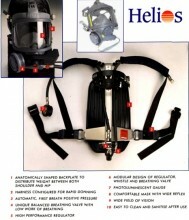 Spiromatic 90, High performance Breathing Apparatus. Spiromatic 90 has a variety of optional harness and cylinder configurations; with accessories for umbilical attachment, intrinsically safe radio communications and 'Head-up' control displays. It is often best to select only the accessories that suitably fit your risk assessment. Don't buy add-ons that you are unlikely to use. This premium version, has a single adjustment, two-point harness that needs very little time in donning and doffing, yet which remains secure, stable and comfortable when crawling through access hatches, climbing and negotiating hazardous objects. It also provides an 'extra-air' point, or umbilical attachment; chest mounted, for ease of access; which may be used for distal air supplies or to provide air to a rescue mask, used during rescue. The harness and frame incorporate stainless steel back-plate and anti-static, HDPE comfort plate. Webbing is 2-tonne, tubular weave polyamide, for durability and stregnth and the shoulder pads provide hose routing in flame-proof fabric. Standard harnesses are of conventional, belt and two shoulder strap design, with individual adjustment on each of three points. On all of them, are provided ample arrangement for attaching Distress Signal Units, torches and 'extra' air connections, so that, very easily, the kit lends itself to use from airlines (umbilical supply) without fuss - and for deep penetration jobs, of course the Self-contained cylinder acts as emergency, or escape air. This premium harness also incorporates a stainless steel cylinder band, readily adjusted to differing cylinder sizes and types; providing strength, durability and versatility. Common cylinder sizes, used with this kit, include: 207 bar, 6 litre; 207 bar, 7 litre; 300 bar 6 litre- all in lightweight, Manganese-Molybdenum-Chrome steel alloy and a further range of (very expensive) composite, Carbon-Fibre-reinforced plastic cylinders; saving some further weight. With this configuration are enabled easily adapted, twin-cylinder configurations used - generally adopting special cylinder packs that deploy 300 bar, 3 or 4, litre steel cylinders. The free air, delivered from these cylinders varies thus, between 1200 litres and 2400 litres, thus offering typical duration times between 30 and 60 minutes. Cylinders are quick and easy to change, using industry-standard, EN144/DIN477 valve fittings. Incidentally, the Interspiro cylinder valve not only has safety mechanisms preventing accidental closure. It is fully, pneumatically balanced, meaning that control is fast, easy and safe from the vagaries of the 'graunching', so common with other designs! These features add up to 'bullet-proof' performance and such reliability that:if this might be the most expensive SCBA in the market place, it is by far the most economic in spares and repairs, duty for duty. Designed by the inventors of Positive Pressure Breathing apparatus, AGA, you might rightly expect excellent performance from designs patented by one of what was the largest gas and medical engineering companies, in the World. We advise contact to help you select the best configuration for your purpose, before buying. On the 10th of December 2012 Greg James took his BBC Radio 1 drive time show to Camp Bastion in Afghanistan.He broadcast live on BBC Radio 1 and on BFBS radio across Afghanistan.Whilst he was there he made this video - helping the forces to have some fun over the Christmas period.Merry Christmas Everyone! Click the button below to add the Spiromatic 90 XL, cw QC: SCBA less cylinder to your wish list.